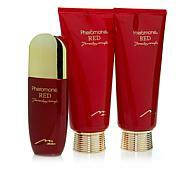 Pheromone Jasmine Duo is a delightful and elegant scent that leaves an unforgettable impression. Enjoy this sensual aura in a body creme and eau de parfum. Ingredients: Alcohol 40B, Perfume Oil, Distilled Water, FD&C Yellow #6, MX204A Pyla Cert Caramel, FD&C yellow #5.